The winner of Laura's book is: Cherie J! Congrats, Cherie! Send me your contact info and I'll pass it along to Laura. Thanks to everyone who participated. -Undines, corresponding to the element of water. Ancient philosophers believed that every body of water, even every fountain, had its own undine. As water was considered to be the element of the emotions, they were nearly always described as female nymph-like creatures or mermaids. -Sylphs, avatars of the element of air, were associated with the intellect and ideas. They were often described as what modern storytellers would think of as fairies or angels. -Gnomes, tied to the element of earth. These were variously described as elf-like beings, dryads, and satyrs. They were concerned with pragmatic matters, with the woods and wealth of the harvest. -Salamanders, corresponding to the element of fire. Salamanders were considered to be the most unpredictable and destructive of the elementals, tied to the fires of creation. Philosophers suggested that the salamander took the shape of the familiar amphibian…probably because salamanders that dwelled in felled logs came crawling out when the logs were burned. Pliny the Elder described the salamander as: “an animal like a lizard in shape and with a body starred all over” (The Natural History). In developing EMBERS, I was fascinated by the idea of a salamander familiar. 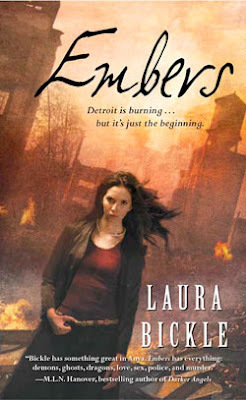 My heroine, Anya, is an arson investigator and a medium searching for a serial arsonist in Detroit. Like the guardian daemons of Plato’s era, Sparky the salamander defends Anya from malicious spirits – when he’s not chewing on her cell phone or shorting out the microwave. I wanted to capture a bit of the wildness of the classical salamander into his behavior. Overall, I found the idea of a human-elemental partnership intriguing. Since the time of Socrates conversing with his daemon, the idea of an elemental familiar has persisted. I suspect that ancient and modern peoples have all yearned for a bit of the same thing: a connection with nature. It’s no wonder that, in an increasingly urbanized and mechanized society, there’s a visceral desire to bond with something as primal and ancient as the four elements. Laura will give away a copy of her book to one commenter. Her winner will be selected and posted on Tuesday evening. Stop back by to see if you won. Sounds like an interesting book. I may have to check it out or at least add it to the tbr pile. I agree with Katie! Sounds like a totally rockin' read! It's most definitely been added to my wish list! Wow, this book sounds fantastic! I can't wait to read it. Count me in on the contest please. Oooh, sounds like a fantastic book! I would love to read it, count me in! sounds like a great read. will check it out further and to my wish list. Thanks, folks! Sparky, Anya's fire salamander, was a blast to write. When he wasn't chewing on cell phones or licking electrical outlets, he tends to be rather possessive of Anya. That tends to put a crimp in her love life. Intriguing, definitely something I would read. Added to the Never Ending Pile of Books to Read. I have been eyeing this book for couple days. I'd love to read it. it's intrigued me ! I love the familiar tied to the elements storyline. The first time I read something like that was The Fire Rose by Mercedes Lackey. I love that book. Can't wait to read your take on them. I haven't read THE FIRE ROSE, but I'll add it to my TBR list. Thanks for the tip, Beth! Great post. Embers sounds wonderful. I love the cover. I have a parrot for a familiar. I can only imagine the problems with having a salamander. Though, it would make barbeque season great. Thanks so much for sharing. Embers sounds like a great book. I am really looking forward to the chance to read it. I will have to keep an eye out. I love the mythology tie-in as well. Thanks for stopping by and for the great contest. This book is definitely going on my TBR pile, massive as it is! Sounds like a great read. I am intrigued by the concept of using a salamander familiar in partnership with a human. What a great idea! Thanks so much for the kind encouragement, folks! As for the reasons why familiars partner with humans...more on that in the sequel, SPARKS. Turns out, Sparky picked Anya to be his human for better reasons than her taste in classic cars. He chose her because she'd be an appropriate protector for the newts he's raising in her bathtub. If one familiar is a handful, imagine the damage that thirty can do!